Now that I'm sewing almost every day, the dining room has turned into my sewing room. While Mr. H says he really doesn't mind, I would love to have a sewing room where I wouldn't have to put everything away every night, where I could put a spool holder on the wall instead of throwing them all in a plastic bin,where I'd have drawers for all of my fabrics instead of stuffing them into a bag each night. We have a deck on the side of our house that we never use. It just gets way too hot in the summer and of course during the winter we don't go outside much. Here is what it currently looks like. Here is the view from inside the house. I think it would be perfect to enclose this area and turn it into a sunroom/sewing room! Ever since I thought of this possibility, I've been obsessing over it. The problem is we have a kitchen to renovate and a front porch to re-do so I'll have to try to figure out how to squeeze a sunroom/sewing room addition in there somewhere! That sounds like a wonderful idea! Just take one project at a time by priority. The more one can do themselves, the more one can save. All of those sunrooms are so beautiful! 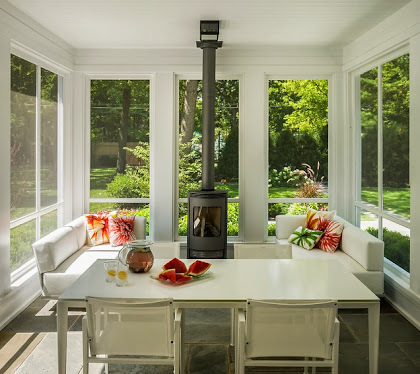 Adding a sunroom is a good idea but you might run into a setback issue with the property line ~ it doesn't look like there is a lot of space between the deck and the house next door. You could totally add a pergola and a wisteria but that doesn't give you any sewing space. Do you have a spare/guest room where a small sewing table would fit? I did the whole crafting on the dining room table at our old house and it was impossible because everything would have to be cleared for mealtime and I spent more time setting up and tearing down than I crafted. Whatever you decide, I hope you are happy! Merry Christmas, Khammany! Hello Khammany - I used to sew at my dining room table too but when my boys left home, I took over one of the spare rooms. It is much better as I can make a mess in there & close the door on it :-) I think a sunroom idea would be great & nice & cosy for sewing in winter also. Just be patient - I am sure it will happen one day for you. I know exactly how you feel, for years I had to sew on the dining room table and as you say it's the putting away of everything that's the bug bear. Could you not have a table in a guest room.? Guests come & go occasionally so make your sewing & crafting the priority. 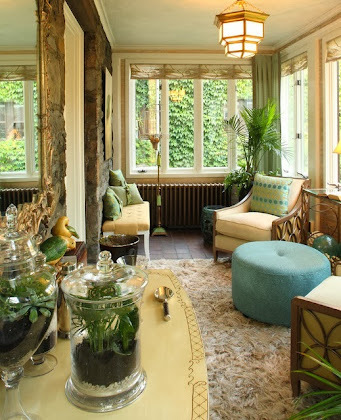 The sun room for sewing is a great idea, but as you said there are other needs to consider first. Be patient Khammany, as the old saying goes 'Rome wasn't built in a day' Keep warm and happy sewing. There's always so many never ending projects on the list! I do love the inspirational photos for a sunroom. Perfect place to set up shop for your sewing projects. 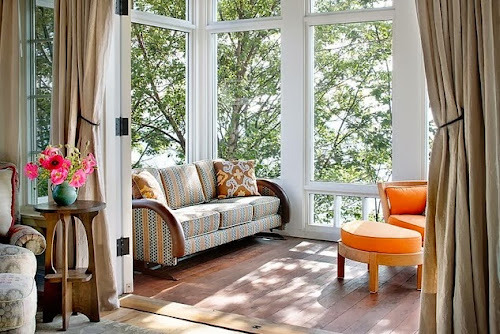 I think a sunroom is a great idea! I love the piece you have on your deck right now...gorgeous. It's so nice to dream of these spaces. The wait will only give you more time to tweak your ideas for the new sewing space...I hope your wish is realized and can't wait to see when it is! That is a wonderful idea! Love the pictures that you have shown. The second picture is my favorite. You would enjoy it and hope that you get that addition soon! That sounds like a great idea…go for it! I am so pleased for you and your passion and talent for sewing! Beautiful project which you are planning and the piece which you have on your deck now would be delightful in your Sunroom/sewing room! We are supposed to start our sunroom addition this coming monday...finger crossed, as they have already pushed us back 2 weeks since the date they originally said. The idea is great and if you have to postpone the realisation for a while, just think of it as more time to plan your project! This is how I imagine all the postponing that happens at the cottage!!! I think that an enclosed all season room is a terrific idea, you have some great inspiration pictures to use to build your dream sewing room in your mind until it can become a reality. I always wanted an enclosed all purpose room like that. I think it is probably to late in my life now to think of such things. If you really want it, start planning now so that someday can really become a today. 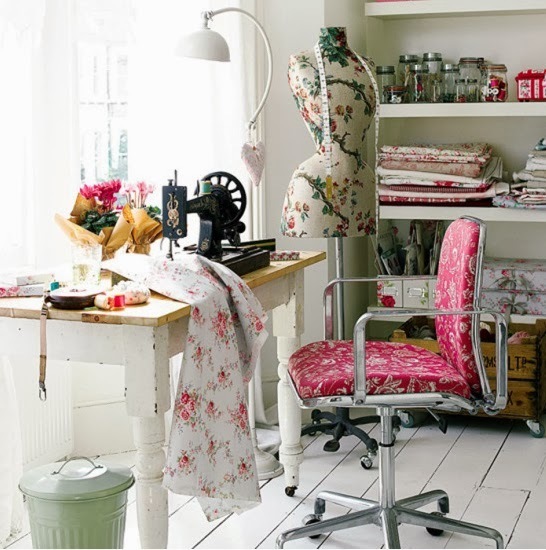 How nice it would be to have a sewing room of our own. You know, my sister sews, knits, and crochets, and I have always thought it was such a talent. I hope you like where your new sewing room is and you can do many projects in there. Thank you for stopping by the blog tour. It was so nice to see your comment. wow i love your idea.what a decoration of this house.nice picture of home. Such great rooms! I can just walk into one of them and drop like a log on one of the couches. I really love the first one, though. It feels very close to nature, and I could just sit all day staring outside. I say go for a sunroom makeover! I bet it will inspire you more to sew.